Chubby Hearts over London is a public design project conceived by the fashion designer Anya Hindmarch as a love letter to the city. Starting on Valentine’s Day and continuing as a celebration of London Fashion Week, giant ChubbyHeart balloons will be suspended over (or sometimes squashed within) 29 famous London landmarks and prominent locations across the Capital. The balloons will float from dawn until dusk each day, reappearing above different locations the next day over the coming seven days. The Mayor of London, the British Fashion Council, the City of Westminster, councils, landowners, businesses, districts and the Civil Aviation Authority have joined together to create this project which will feature over Trafalgar Square, Battersea Power Station and Westminster Cathedral to name a few. Councillor Robert Davis MBE DL, Deputy Leader and Cabinet Member for Business, Culture and Heritage at Westminster City Council said: “The City of Westminster is already the beating heart of our great capital and the home of London Fashion Week, so it is entirely apt we are celebrating this with a striking display from one of London’s most foremost designers. Ocean Outdoor is supporting the campaign across four of its full motion London screens including Leicester Square and both Westfield shopping centres. 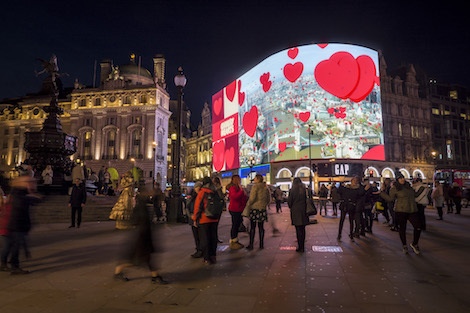 And the Chubby Hearts will take over Landsec’s Piccadilly Lights for a 40 second slot during the early evening on Valentine’s Day. This entry was posted on Wednesday, February 14th, 2018 at 11:21 @514 and is filed under DailyDOOH Update. You can follow any responses to this entry through the RSS 2.0 feed. You can leave a response, or trackback from your own site.